Jon Rowe and I (Terry) made our way up to Sugarloaf Maine for the third year in a row to race the Carrabassett BackCountry Challenge 100K, with NAV alum Bryna in tow as well to try her hand at the longer 100K distance after having enjoyed the 50K version there last year. The great trails there keep us coming back (as does the opportunity to visit my sister’s family in nearby Farmington), with NEMBA having invested ~$500k in trail-building over the past handful of years, from the single-track network surrounding the Outdoor Center used as the race central venue, to the BuckShot rock-armored switchback climb mid-race, to the big Oak Knoll flow trail descent off the race’s last sustained climb dropping down back towards the finish, with plenty of rustic trail to fill in a single big 100K loop. 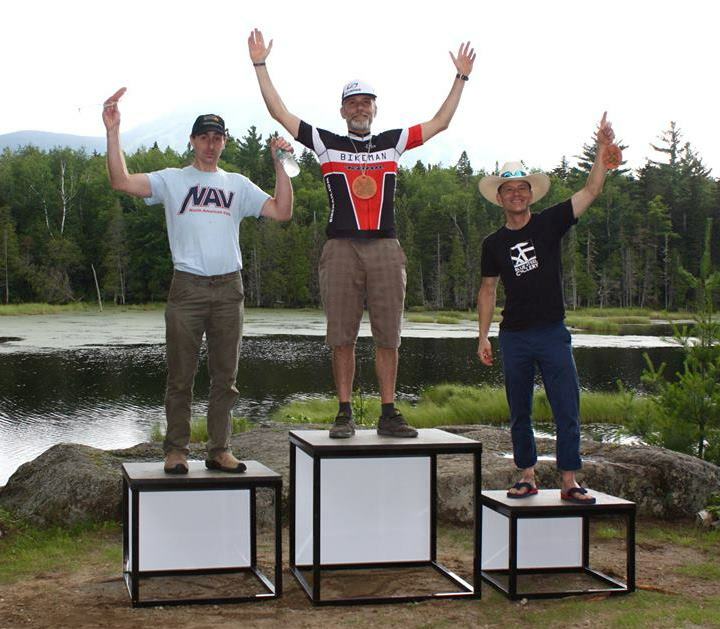 The fields were considerably bigger than previous years as the National Ultra Endurance (NUE) just this year added Carrabassett to the 100K “Marathon” series it recently developed to complement its traditional “Epic” series of venues offering 100mile MTB races. We lucked out on the weather, with a morning rain ceasing just before start time and generally holding off for the rest of the day. 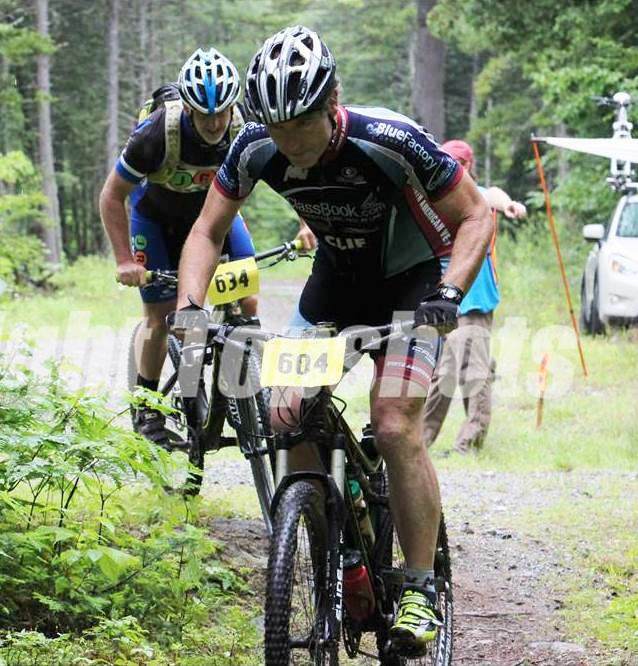 Jon Rowe rode a really fine 6:05 time to take 2nd in the Masters 40-49 field, while Bryna was only about 20minutes back with a fantastic ride that netted her the Women’s Overall win over well-known endurance racers Linda Shin making the trip from Toronto and Karen Potter from MA. As for myself, I was pleased just to have a mechanically clean ride this time around, having torn my rear der off last year and flatted the year before, with a 6th place out of 38 in the Masters 50+, less than 8 minutes back from 2nd place as the lead group in our Masters 50+ field kept it pretty tight throughout this 6+ hour race. Will certainly be looking forward to another return to Carraabassett next July, for sure! 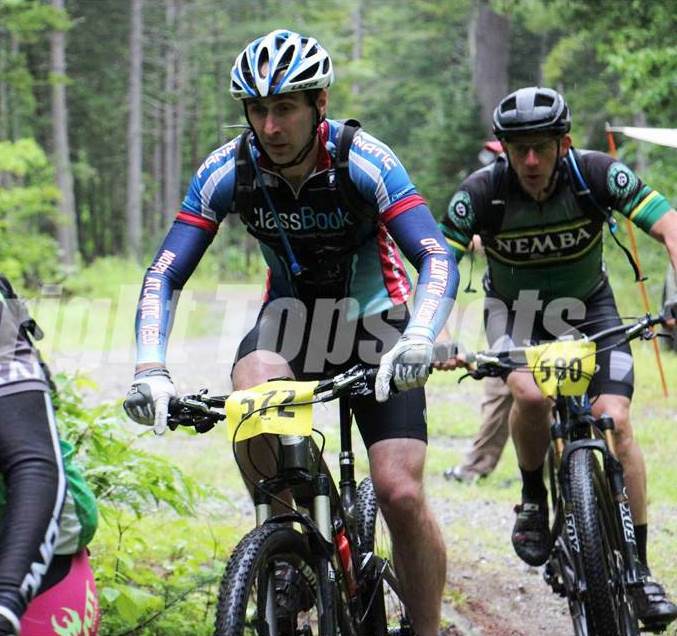 For a nice sequence of pix of Jon, Bryna and Terry all tight together early in the race, check topshots.smugmug.com/2017/Carrabassett-Backcountry-Challenge-2017/i-RP78JZq/A and scroll forward from there.